Examining the peripheral retina is critical. Some of the most harmful eye diseases, such as retinal tears, ocular tumors and diabetic retinopathy, occur in the far periphery of the eye, making them difficult to detect. Symptoms often do not manifest in the early stages and vision may not be affected until there is significant and unrecoverable damage. WHY IS AN ULTRA-WIDE FUNDUS EXAM IMPORTANT? TO TAKE CHARGE OF YOUR EYE HEALTH! 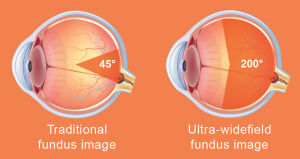 Using the ultra-wide field fundus imaging technology, we can capture a wide, high-resolution image of your retina, facilitating comprehensive assessment of your eye health and aiding in the early detection and management of eye disease. 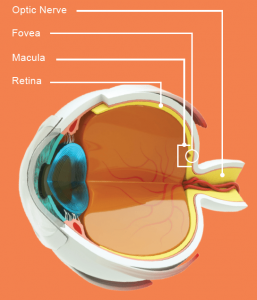 The ultra-widefield fundus exam is beneficial even if your eyes are healthy. By documenting the health of your retina periodically, your eye doctor can compare images side-by-side and detect subtle changes in your eyes over time. These changes might otherwise go unnoticed and can be the hallmark of early changes in your eye health. 1. Chin rest/head rest: A simple head and chin rest allows the patient to maintain a stable, neutral position while the operator brings the optics to the patient, facilitating a more comfortable imaging experience. 2. Swivel motion: The ability to swivel the device between the right and left eye helps technicians capture a high-quality image without realigning the patient. 3. Live IR preview: Live IR preview allows the technician to confirm image quality and screen for lid and lash, prior to imaging, ensuring fewer image recaptures. This is very important in assisting your Federal Way optometrist to detect and measure any changes to your retina each time you get your eyes examined, as many eye conditions, such as glaucoma, diabetic retinopathy and macular degeneration are diagnosed by detecting changes over time. With an OCT scan, Federal Way eye doctors are provided with color-coded, cross-sectional images of the retina. These detailed images are revolutionizing early detection and treatment of eye conditions such as wet and dry age-related macular degeneration, glaucoma, retinal detachment and diabetic retinopathy. An OCT scan is a noninvasive, painless test. It is performed in about 10 minutes right in our office. Feel free to contact Kosnoski Eye Care to inquire about an OCT at your next appointment.